When you are ready to transform your home interior with moisture-resistant wood-look tile in Lititz, PA, come talk to us at Cloister’s Flooring America. 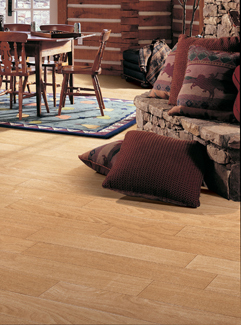 Our showroom is the area’s premier provider of durable tile floors that imitate authentic wood. This beautiful flooring option is easy to clean, and it stands up remarkably well even after years of heavy foot traffic, humidity, and spilled drinks. These tiles combine the longevity of porcelain with the appeal of wood planks for a unique flooring solution. This means that the material works well even in moisture-heavy rooms like the bathroom. Reach out to us to learn more about this exciting material if you are about to start a home improvement project. Today’s ceramic tiles can duplicate the appearance of various types of hardwood planks. The items in our showroom come in many grain variations and shades for an organic look at an economical price. Wood floors are a timeless classic, and with wood-look tiles, you have the opportunity to remodel your property with a one-of-a-kind flooring material. What’s more, this wood-imitating tile has the thermal advantages of ceramic, meaning it helps to keep your home cooler in the summer and warmer in the winter. When you come to our showroom, you can speak to one of our friendly and knowledgeable store associates. We’ll listen to what you’re trying to accomplish and match you with a wood-look tile that’s the perfect fit for your project and budget. Then, we will provide installation on your new flooring so you can be confident that the job gets done correctly. Often, homeowners want the natural appearance of wood but require a lower-maintenance flooring material. Porcelain tile with the look of hardwood duplicates the appeal of the real thing but with improved resistance to moisture and stains. Find out how great your indoors will look by shopping for home flooring at our showroom. Whether your project calls for planks or square tiles, our products are the ones you can count on to deliver the results you want. With our comprehensive inventory and professional installers, we are the flooring resource you can trust to make the most of your home’s interior. Turn to us for our wood planks, laminates, and other flooring solutions. We’re ready to show you the excellent service and pricing that makes us the leading flooring retailer. Contact us for ceramic tile that imitates authentic wood. Our flooring showroom in Lititz, Pennsylvania, serves customers from throughout the area of Hershey, Elizabethtown, Reading, and Marietta.